I own my own business and I sell used clothing that sometimes have very harsh stains that are set in. This I put on the stain or dirt spots and I let them sit and throw them in the wash and they come out as if there was no stain there. I highly recommend this stick! This also works for washing Caps that have the yellow brim from sweat. Accidents happen, and when they happen on your clothes you don't always have time to wash them right away. I like to keep a stain stick around for those times. I like the solid type, because they don't seep through the cloth, so you can treat the stain before the clothes are even off. Oxiclean is not such a stick. It's actually a gel that is released when you press down with it, like a stamp. The end of the sticky has plastic nubs so that you can then rub in the gel. The gel seeps right through, so treating the stain while the clothes are still upon your person is not recommended. However, it is great at pre-treating stains. I recently had occasion to test just how good, when some hair dye gooped onto a green t-shirt that I was not wearing at the time (that will teach me to wave my head around with drippy dye on it). The blue t-shirt I was wearing is one I specifically save for that task and it is a testament to just how fast a hair dye stain can set into cotton, because it is mottled. I didn't have time to wash the green t-shirt, so I used the gel on the hair dye stain and hoped for the best. Just washed the t-shirt, and lo and behold, that hair dye stain is gone. I don't know how well that would have worked on a white t-shirt, but the green is clean. Nice job Oxiclean. Bright white pants are white again! This product took all the red juice stains out of my mother's white polyester slacks! I never believed they would be wearable and presentable again, because there were large stains all over them, but with what I now call "My Magic Goo," the OxiClean Max Force Gel Stick, every bit of that dried in cranberry stain was gone! The only problem I have with this product is that it can come out fairly quickly when you press down on the top scrubbing nubs, so you can get too much of the gel at once. But once you get the hang of using the right amount of pressure, you'll love it! I was so impressed, I went out and bought four more of these sticks to have on hand. I don't recommend using it on colors unless you try it once on an inconspicuous area, because it did bleach out some of the color on some colored fabrics. I picked a stick of this up at the grocery store a few years back because it was on sale and I had a coupon. I've used it ever since. I've been amazed at some of the stains I've been able to get out with this gel stick. I love the design of the top and how it helps scrub the gel into the stain. One of the best laundry products there is! Been very impressed with this spot treatment, but never so much as the other day when my kids put LOTS of food coloring in their hot cereal- my 2 year old's white t-shirt was blue all down the front! I didn't even get it in the was until the next day, but I just gave it a quick pre-scrub and voila! It came out of the wash white again! I also love how easy it is to use- my hands don't get soapy and slimy scrubbing spots. OxiCleans only when the shirt is completely saturated in it. I have kids.... That should be enough said to know that there is often messy clothing in our house - even Little Miss is a diva of dirt. I've previously used Shout as it was just about the only thing available. Unfortunately it just wasn't cutting the dirt and the clothes were still coming out with stains. So on to looking for something new. Since OxiClean is supposed to be a leader in stain fighting, I figured the Max Force Gel stick would be helpful in our quest for clean clothes. OxiClean Max Force is a pretreating gel that comes in a stick. The top is textured with large bumps, presumably to help work the gel into the clothing. I would much prefer this top to be like a brush instead as it's really difficult to spread the gel around with the bumps. I do however like applying the gel directly to the clothes instead of spraying it on. I can verify where the gel has gone on the clothing and how much. The stick-tube holds about 6 ounces of the gel, which frankly in our house goes pretty fast. When I use the OxiClean gel the only way I've gotten it to really be effective is to completely saturate the garment with the gel. After a few shirts full of mess, the stick is half used up. Unfortunately the results are mixed for us. We had a completely blood soaked shirt that came out spotless, yet simple chocolate or dirt stains it didn't even touch. The difference was the bloody shirt was saturated in the gel before being washed, whereas the others merely had a spot of the gel. This does not really sit well for a tight budget. So I'm torn on this stuff... It works, but for us it's not an economical solution. I have a tendency to be a bit klutzy so there are always spills and stains occurring if I'm anywhere near. You'd think that I'd learn to not cook while wearing good clothing nor eat spaghetti whist wearing a white shirt. But I don't so I need products like **OxiClean Max Force Gel Stick **to rescue my clothing from myself. All I need do when I find a stain is remove the cap, turn the stick upside down, place directly on the stain and quickly press down to release the product. The gel shoots out of the stick in a star-shaped pattern, sort of like a cookie press shoots dough onto a cookie sheet in whatever pattern you've selected. This annoys me slightly as sometimes I have several small grease splatters in various places on a shirt so I don't need that much gel on each spot and found it wasteful. As a result I now squirt the gel on the largest spot then use an old, soft toothbrush to move some of the excess gel to other spots. I usually let the gel sit for at least 10 minutes to allow it to work. Most often I pre-treat an item and let it sit for however long it takes to wash a load of clothes, then I throw it in with the next load. 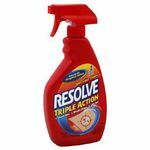 I've used this to remove grease stains from all colors and spaghetti sauce from white clothes. It almost always takes the grease stain out on the first try, but the white shirt didn't come 100% clean on the first try. 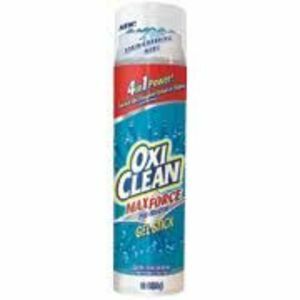 I used to use Watkins Degreaser to solve grease stain issues (the stain I'm most likely to get on my clothes) but they discontinued it so I tried OxiClean Max Force Gel Stick to see if it would work as well. It doesn't work quite as well as the Watkins product, but worked better than Dawn dishwashing liquid did so I'm happy with this purchase and would buy it again. Stubborn Stain Remover Oxi Clean Gel Stick...to the rescue!! I had several items of laundry that I have washed repeatedly over the last few weeks that did not seem to ever come clean. They were stained with oil so I tried a few home remedies my mother told me about, but to no avail. I was really frustrated so I decided to try something store bought instead. I stopped by my local drug store and looked for a stain-remover and saw new on the shelves Oxi Clelan Max Force Gel Stick. 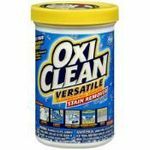 I have previously used the Oxi Clean powder and thought it worked OK. But, I was more interested in a spray, liquid, or even gel (as I saw on the shelves) to remove my stains. I was a bit leery to try this "new" item, but desperate nonetheless so I actually ended up buying (2) of the Oxi Clean gel sticks...just in case my hunch was right and it worked! I took it home and followed the directions and treated my stained clothing as needed. Then I re-washed them and low and behold...they ALL came out spotlessly clean! Bye, bye oil stains!!! This is best stain pre-treater product I have ever used! In my opinion, it beats other brands -- hands down! 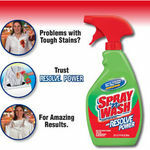 It is new, but definitely worth a try on those stubborn stains that you just cannot seem to get out. Honestly, it was hard to measure so that is the only thing I disliked about it. I just spread it over the stains covering them the best I could and hoped for the best....which is actually just what I got! I decided to try this out because I use the OxiClean powder as a soaker for my bad stains, but even that isn't enough for dome of the stains I come up against. This is the best pre-treater I've ever used! I tried it on my baby's socks and knee spots (she's an avid crawler and learning how to walk). I thought for sure that it wouldn't be able to get out some of those stains, but it worked like a charm. I used the stick as a pre-treater and then soaked overnight in the OxiClean powder. Her white xoks that had turned this awful brown actually came out glowing. I had done the straight soak with them before with little effect. This stick is amazing. Here are my only 2 negatives: #1: Not all of my local stores carry it, so sometimes I find myself going out of my way to get it (it's worth it, but a little bit of a nuissance. 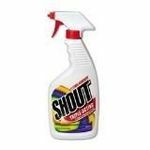 #2: It's really easy to go through this stuff, especially if you get a lot of tough laundry stains. I use a stick every 2 weeks or so. Other sticks last longer than that, but they don't work half as well. My advice is get a couple when you go to the store! Great for messy baby clothes! I have a five month old baby boy and like any boy he has a way of making everything dirty. I can put a diaper on as tight as I can get it and he can still explode out of it. Well this means I get the joy of cleaning off his clothes. I use the OxiClean stick all the time and it is a life saver. Since my husband and I travel a lot with our son I do not always have access to a washer and dryer. When my son explodes I just rub the gel around the area that has poop on it and then throw it in a plastic bag until I can get home to wash it. The great thing is if I forget to put the gel on the stain when it happens and I put it on before I do the laundry the stain still comes out. I've used it on every one of my son's explosions and his clothes come out just like they were before his explosion. If you have a baby who makes a mess this is the perfect thing for you! The yellow poop stains have come out of my son's white clothes and you would never know that he exploded in them. Go and get yourself an OxiClean Max Force Gel Stick. It works!